Apture, the startup that lets online publishers enhance content with rich media pop-ups from a variety of sources based on the context of linked words and terms, is launching a nifty new plug-in today that brings instantaneous search to content on the web. Called ‘Apture Highlights,’ the browser extension aims to plug the “search leak” that the company says is taking place with content on the web. Apture highlights a search leak as when a users is reading content, wants more information about a keyword or phrase and then opens another browser tab to search for the information on Google, Bing or Yahoo. The downside for the content publisher is that the user disengages with the actual content by leaving the page. 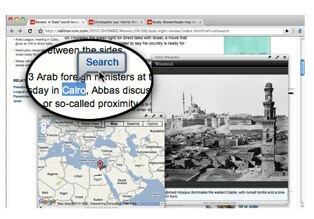 Apture Highlights allows you to highlight any word or phrase on a page and instantly bring up search results in a window. The startup brings results from 60-plus sources including YouTube, Twitter, Wikipedia, Google and more for extra context around content. The browser add-on is currently available for Chrome, Firefox and Apple’s Safari browsers. Apture has been offering the technology for publishers such as the Financial Times and Reuters for some time now. But this is new add-on represents the startup’s first offerings for consumers. And publishers say that Apture’s plug-in increases engagement, with interaction with their site increasing by two to three times when activated. Apture says that publishers are also increasing their search volume and site page views by driving traffic to related articles for every search. I’ve installed the add-on and it’s actually very useful for looking up keywords without needing to leave the page or article. And adding context to content through search is something that even large tech companies like Yahoo are trying to get into. Yahoo just released a feature called Infinite Browse, which will suggest searches for specific terms around news content. 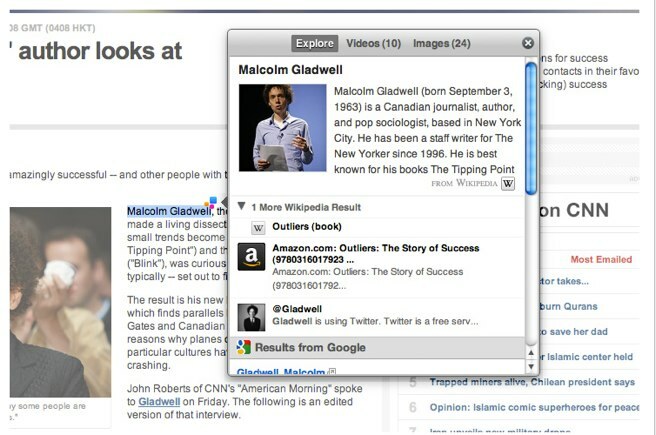 Similar to Apture, the idea behind the new feature is to allow readers to access related content they would search for without having to go to a separate search portal and type in the query. Launched in 2008, Apture has raised $4.1 million in funding.